The NOAA polar-orbiting satellites (POES) have been collecting sea surface temperature data for over 22 years. This animation is a compilation of that data from January 1985 - January 2007. Of note are the changes in the Gulf Stream, El NiÃo and La NiÃa cycles (ENSO) in the Pacific, and the seasonal changes in sea ice cover. Further changes in sea surface temperature have occurred since this visual was made. Educators should seek up-to-date data if needed. This NOAA page contains more recent data and figures: [link http://www.ospo.noaa.gov/Products/ocean/sst.html 'NOAA Sea Surface Temperature']. Comments from expert scientist: The strength of this resource is that it provides a visual animation of change with time. Therefore, in a minute or so the reviewer gets a real feel for the magnitude of SST changes throughout the time period that we have been making observations. This is an incredibly beneficial tool for use in a classroom! Have students keep track of ENSO fluctuations, the seasonal changes of the sea ice, and polar sea surface temperatures. This is only one of many NOAA visualizations that may be useful in the classroom. 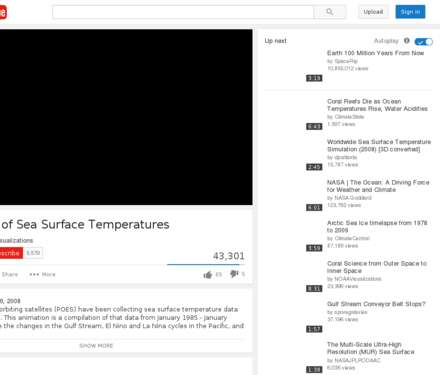 As with this and other NOAA Visualizations on YouTube, educators may want to embed the video on a different website because the comments that follow it can be distracting or inappropriate. Video can be embedded on another website to avoid commentary on YouTube site.